Stringybark Creek was the site where Ned Kelly and his gang – brother Dan Kelly, Steve Hart and Joe Byrne – killed three of the four policemen searching for them. The gang ambushed the police base-camp at Stringybark Creek and only Constable McIntyre managed to escape, taking refuge down a wombat hole. The Kelly gang were subsequently declared outlaws. 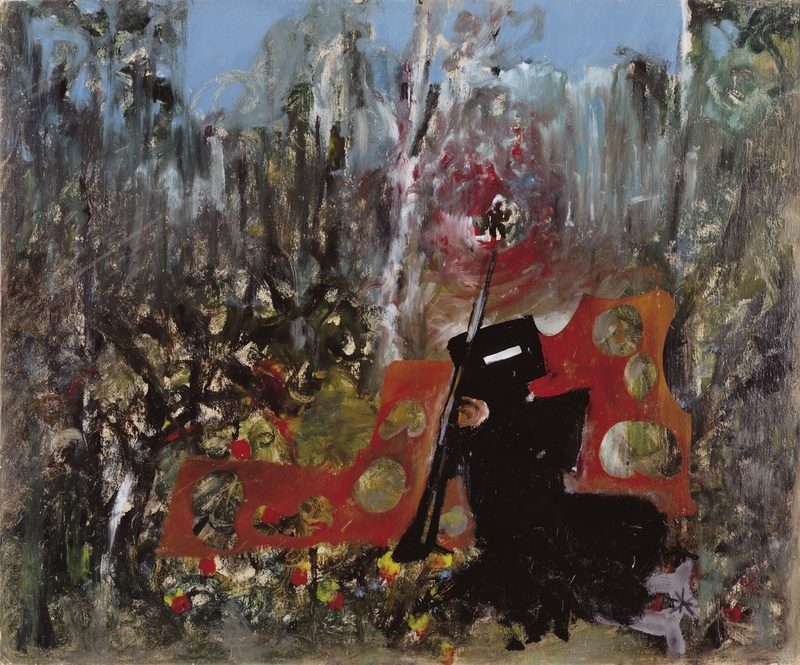 This painting depicts Ned Kelly, fully clad in his armour, defending himself from behind a tree trunk punctured by large bullet holes. While Kelly’s head is facing the viewer, the barrel of his rifle is directed towards a figure, presumably one of the policemen who died at Stringybark Creek. The harsh, dense, brown bushland provides a theatrical backdrop and frames the two figures drawing attention to the violence, symbolised by the swathes of red paint. The sense of tension and drama is palpable in this work which Nolan painted on the same day as Kelly and Scanlon (1945) which also refers to events at Stringybark Creek.